The 1962 remake of the Oscar Hammerstein musical State Fair can’t seem to emerge from the shadow of its’ more popular original source material. In fact, the film is largely only available in box sets partnered with the 1945 feature. However, the later take on State Fair packs an A-list cast and brings just as much (if not more) vocal talent than the original movie. Interestingly, the remake of State Fair also features a number of important elements, which upon further analysis shows a growing presence of female sexuality and autonomy, in what is still very much a traditional Hollywood musical. State Fair follows the Frake family as they leave for the annual Texas State Fair. While there, each member of the family has their own romantic adventures. Eldest son Wayne (Pat Boone) falls in love with nightclub performer Emily (Ann-Margret), while daughter Margy (Pamela Tiffin) meets a dashing journalist Jerry (Bobby Darin). The musical number “Willing and Eager” occurs midway through the film as the passion between Wayne and Emily reaches a boiling point. As the scene opens, Wayne reclines on the sofa while Emily massages his shoulders. His shirt hangs loosely over a near-by chair. She stands up, jarring Wayne from his extreme relaxation. The couple steps out onto the balcony and passionately kiss. Behind them, a bed dominates much of the frame as they launch into the song. They are filmed from the waist up, in an increasingly tight close-up. Throughout, their hands are all over each other. The shot is tight, personal and quite sultry. The number is an interesting one; however, it becomes increasingly complicated when considering the star personas of the respective performers. Ann-Margret holds a very unique place in Hollywood history. The actress debuted in Pocketful of Miracles in 1961, and experienced what can only be described as a meteoric rise. Within the next two years, the actress made five films and found herself a household name. She quickly developed a star persona that reflected the blurring societal lines relating to female sexuality. In years before, women characters fell into one of two camps: the Madonna and the Whore. The “good girls” were sweet, innocent and often virginal. On the other hand, the “bad girls” were sexual, cunning and ambitious. While they were always delightful, they typically were punished in the end. However, Ann-Margret came on the scene in 1961 and blew this dichotomy out of the water. Ann-Margret’s star persona is decidedly complicated. The actress brings an inherent energy to her performance. She’s fun, interesting and vivacious. Above all, she injects a sexuality which is difficult to ignore. This is notable even in her earliest film roles, Viva Las Vegas and Bye Bye Birdie (where she plays 16 year old Kim McAfee). While just ten years earlier, this would have stuck her as a “bad girl”; her career took off at the right time. In these works, Ann-Margret is typically cast in the main romantic leading roles, and often as a girl next-door. Watching Ann-Margret’s performances in the early 1960s shows a growing acceptance in Hollywood of female autonomy. A woman wasn’t either a “good girl” or a “bad girl”. She could suddenly be a little bit of both. Meanwhile, singer Pat Boone grew to represent the taming of the rebellious 1950s rock and roll culture. Suddenly, Elvis Presley, Little Richard and Chuck Berry found themselves competing for sales with singers like Boone, Frankie Avalon and Bobby Rydell. 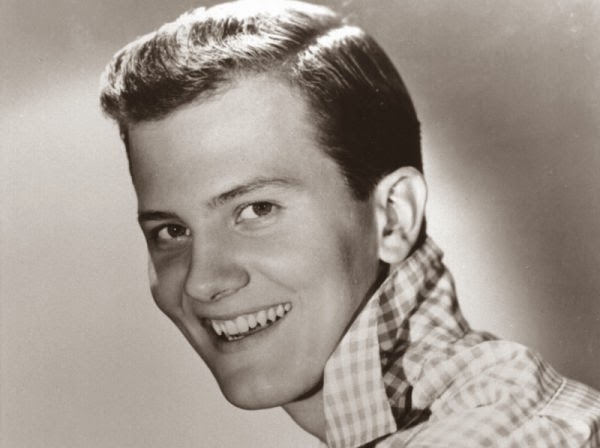 Pat Boone looked clean-cut, respectable and was openly church-going. He burst on the scene in 1956 and had a number of hits with songs like: “Love Letters in the Sand” and “April Love”. He was the “rock and roller” a girl could take home to mom. So, the content and staging of “Willing and Eager” becomes even more interesting when examining the star personas of the film’s two leads. While Boone featured in a number of earlier romantic roles, they largely were very chaste. In fact, there was a long-time rumor (denied by Boone) reporting that he had a clause in his studio contact ensuring that he wouldn’t kiss his female leads on screen. While this is simply a rumor, it does reflect the prevailing societal view of Pat Boone. He was a “good” boy. Thus, when analyzing this scene, it is not a huge stretch of the imagination to assume that Ann-Margret’s Emily deflowered the ultimate good-boy of the 1950s. Looking at other parts of the film, State Fair definitely has its’ problems. In fact, it fails the Bechdel Test. While there are three named female characters, the only substantive conversations happen between Margy and her mother Melissa (Alice Faye). Furthermore, these discussion revolve entirely around men. There’s a particularly cringe-worthy moment as Melissa sings a song to her daughter about how you should “Never Say No to a Man”. At the same time, the Bobby Darin and Pamela Tiffin pairing is an interesting one. While Margy seems to be an innocent farm-girl, there is much more to her beneath the surface. “I guess you think I’m some kind of an angel, but I’m not. I have feelings people in Banning don’t even know about”. There’s an uneasiness to Margy which her chemistry with the more aggressive Jerry highlights. While Margy remains devoted to her boyfriend Harry; she finds herself bored with her life. She’s attracted to the brash young journalist because Jerry is everything her life isn’t. He’s exciting and fun. She wants that. This pairing is a well constructed relationship in the film, and this subtext running throughout their story injects a needed depth into the potentially bland character of Margy. The 1962 remake of State Fair often finds itself overshadowed by the original 1945 version of the movie. In fact, the tiny film is actually is an interesting one. While it’s very traditional and conservative on the surface, there is something bubbling just underneath. The transition is most noticeable in the telling casting of Ann-Margret. The actress’ rise in the early 1960s demonstrates the rapidly occurring evolution in female characters. The good girl, bad girl dichotomy was quickly becoming outdated to be replaced with more freedom and autonomy.